ü Beam of Light reaches almost 500 meters (In Clear Weather). ü Halogen Lamp of 55/ 50 watts. ü Length 250 MM and Diameter 160 MM. ü Maintenance Free 12 Volt 7Ah Rechargeable Lead Acid Battery (Exide). 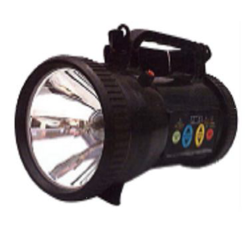 With rich industrial experience, we are engaged in offering a quality approved assortment of Rechargeable Torch Light. 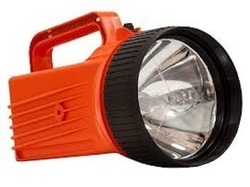 The Rechargeable Torch Light we offer is known for its rechargeable nature. Besides, these can be recharged easily as per the requirements of the clients. - Weather Proof Strong Plastic Body. - With Bright White LED Reflector. - Sharp Focus long distance Beam Light. We supply high quality LED Rechargeable Torch to customers. LED Rechargeable Torch has automatic control and an extended battery life. It can be charged through electric or solar power to provide an uninterrupted backup of 7-8 hours. Continental Device India Limited is a pioneer manufacturers of LED Lights. The product range is widely appreciated by the clients due to its Durable Finish Standards, High Corrosion and Vibration Resistance and Longer Life. Solartech Hand Held Rechargeable Torch is light weight and handy source of light in the areas where conventional electricity is not easily available. These torches have been developed for the De fence Forces, Customs, Paramilitary Forces, Police, Forest Deptt. etc. for outdoor movement, surveillance, patrolling, searching operation etc. during nights. We are instrumental in offering an LED Rechargeable Torch to our clients in diverse colors.These are fabricated using the superior grade raw material, which is well sourced from the trusted vendors present in the market. We offer Khazana Rechargeable Accumulator.These Rechargeable Accumulators also have a special diaphram compatible with brake fluid and can be Recharged. They fit in a different location than the stock unit due to size orientation. If the diaphram should ever fail, just replace it and recharge the unit. No more buying stock Accumulators over and over again.